A fine swing-oriented tenor saxophonist, Ventura is best-remembered for his attempt at popularizing bebop during the tail end of the music's mid- to late-'40s heyday. Born Charles Venturo, one of thirteen children in a musical South Philadelphia family. His first instrument was C-melody sax. He switched to alto before eventually settling on tenor. Ventura left his day job at the Philadelphia Navy Yard in 1942 to join Gene Krupa's band. He became a featured soloist with Krupa, playing with the drummer from 1942-1943 and 1944-1946 (working in the interim with guitarist/bandleader Teddy Powell). 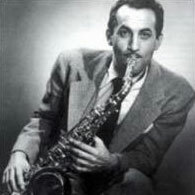 Ventura achieved considerable popularity while with Krupa, winning a Down Beat magazine award as best tenor saxophonist in 1945. Ventura started his own big band in 1946 with middling results. He had more success fronting a small band, one version of which included trumpeter Conte Candoli, trombonist Bennie Green, alto saxophonist Boots Mussulli, drummer Ed Shaughnessy, and vocalists Jackie Cain and Roy Kral. Ventura recorded for small labels before getting signed to RCA Victor, which at the time wanted to capitalize on the emergence of bebop. An RCA executive purportedly told him that they wanted the word "bop" in the band's name. Ventura came up with the phrase "Bop for the People," which implied an accessible form of the music. Ventura formed a big band in 1948, but soon cut it down to eight members, retaining Cain and Kral, who were crucial components of the band's sound. The Bop for the People band worked through 1949 (during which time Ventura employed modern jazz's greatest saxophonist, Charlie Parker, on a record date), but in the end Ventura's stab at making a commercial success of bop failed. Indeed, as fine a player as he was, Ventura himself was never really a bopper. During the early '50s Ventura led another big band; formed a highly acclaimed group called the Big Four with bassist Chubby Jackson, drummer Buddy Rich, and pianist Marty Napoleon; briefly ran his own night club in Philadelphia; and also worked again with Cain and Kral. Ventura's health was not the best, yet he continued to work with Krupa into the '60s. After the '50s, Ventura recorded commercially only once (in 1977, with pianist John Bunch for the Famous Door label). Still, he remained active. He worked in Las Vegas (with comedian Jackie Gleason), and fronted various groups in the '70s and '80s, before dying of lung cancer in 1992.